Well, so much for the end of the farmer’s market, it looks like the market is still happening in downtown New Albany (and that’s a good thing!). We have just changed locations and headed indoors and out of the cold! This weekend begins our first week at the New Albany Fire Department Headquarters on Spring Street. Thanks again to Ed Clere for securing this location and to the New Albany Fire Department to graciously hosting, we are most appreciative. 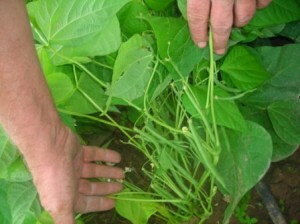 Mother nature won the battle when it comes to her against Kenny and his green beans. He tried for a couple of weeks to keep all thirteen rows from freezing but she won last Sunday. He still has one row under cover that he thinks they will be ready next week or so. He actually thinks he will have fresh green beans for Thanksgiving. The tomatoes are blooming and we even saw a few small tomatoes today. Kenny said “look at these Christmas tomatoes”, we’ll see. I hope he’s right, they would taste great about then. This weekend at the market we will still have home grown tomatoes, new potatoes, some white “Kennebec” and “Yukon Gold”, sweet potatoes, “Candy” onions, a few green peppers, some jalapenos, Thai peppers, GREENS… mustard, turnip, kale and fresh baby lettuce. 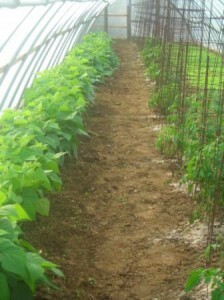 We will have plenty winter squashes… spaghetti, acorn, butternut and a couple buttercup. We will continue our “Customer Appreciation” special… buy 2 winter squash get 1 free through this weekend. 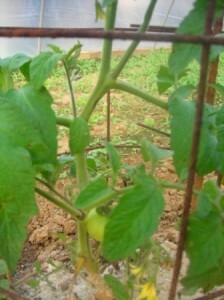 This could be your "Christmas" tomato!